Beach Weekend and Bloody Mary's! This past weekend, Ryan and I headed down to Bald Head Island for a fun getaway with close friends. For three days we feasted on seafood and drank Corona's. It was a relaxing wonderful long weekend. Since this is just one of the many trips we have planned for July and early August, I have not been in the kitchen much lately. Therefore, I want to share the best Bloody Mary we have ever tasted! Our friend, Will likes to eat and drink well, so when he brought homemade Bloody Mary mix to share, I had to get the recipe! The entire weekend, everyone raved about the mix, calling it the best "Bloody" they have ever had! I agreed, although I would have to tone down the spice level a bit for my weak pallet! He combined two different recipes and made his own tweaks for The Ultimate Bloody Mary! Cheers!! Combine all ingredients except V8 and then puree for 3-5 minutes. Pour out (or drink) enough of the V8 to funnel mixture into the bottle. Shake well, chill, add desired amount of vodka and enjoy. I am so excited to share this post with you. Don't get me wrong, I love sharing all my posts with you, but this one in particular makes me very happy! I have discovered the most amazing recipe for brownies, raw brownies to be specific. I know, I know, the raw diet is such a fad and totally gross - who wants to eat cold food all the time! Well, I am here to tell you that it isn't all bad. Close your eyes and imagine a delicious brownie, now think about that brownie not being baked or having any sugar, gluten or eggs. What??? No way, Jessica! I am totally serious though, My New Roots hit the jackpot with this recipe. I have been making them nonstop so I have a constant stash in my freezer for a quick sweet treat. They are perfect and absolutely delicious! The secret to these are Medjool dates - not a common food in American cuisine, but should be! They are very common in Middle Eastern cuisine, which is where most are cultivated. Dates can replace sugar or honey in recipes and are rich in fiber and other vitamins. They kind of taste like caramel!! Dates have a very sticky consistency, but provide layered flavors and texture, which make them great for baking. So naturally, dates are perfect to replace sugar in this recipe. The other secret to these brownies are using raw cacao (not to be confused with cocoa). Cacao (pronounced ka-kow) refers to the actual tree, pod and bean that chocolate comes from. Cocoa refers to the by-products of the raw cacao bean (powder and butter). Many think that the two powder forms are interchangeable, but after some research I discovered that cacao powder refers to raw, unsweetened powder, where as cocoa powder might still have small amounts of cocoa butter in it to enhance the flavor. I had cacao nibs in my pantry, so I ground them first into a powder. Therefor, Mixing the cacao with the dates basically makes a form of chocolate but without the sugar additive. Not to mention that cacao is one of the best sources of magnesium found in nature! The best part about these brownies, they are super healthy! Dates, almonds, raw cacao, walnuts are all super foods. With their powers combined, they are Captain Planet! No, just kidding, but they are super healthy and taste delicious. A cooking phenomenon!! Feel free to get created with the recipe with the add-ins. I like to use a bit of sea salt and chopped raw almonds. My friend Meg makes these a lot as well and adds in coconut. Dried fruit or macadamia nuts would be a great add-in as well. I tweaked the recipe from My New Roots to reduce the amount of dates in the brownies, which helps create a stronger chocolate flavor. It also helps the brownies hold together better and not have as much oils and liquids come out from the dates because of the hot humid weather in NC. Place the walnuts into a food processor and blend until finely ground. Add in the cacao powder and sea salt and pulse just until combined. Add in the dates, one at a time through the feed tube of the food processor while it is running. The mixture will start to come together when pressed. Pour the mixture into a large bowl and add in the chopped almonds. Stir until the almonds are well incorporated, I like to use my hands for this! Press the mixture into an 8x8 pan lined with parchment paper. The consistency will be like fudge in a way, it is dense and thick. This is the third summer Ryan and I have been in our house, and every summer we add one more thing to our "garden." I put garden in quotes because it refers to pots on our back patio. We live in a town home, and are not allowed to dig into the ground, so we have to keep everything in pots. This pretty much limits us to growing herbs and some vegetables. I love having my own little herb garden though! I cook with herbs all the time and even use them in cocktails. I add them to everything and think fresh herbs are so much better than dried! This is one of my favorite recipes to highlight all the fresh herbs from the garden, Zucchini Pie. This year, we got a bit ahead of ourselves and decided to add SEVERAL new things - chives, spinach, oregano and a new kind of mint. I usually get herbs that are already potted and transfer them, and I always buy organic ones so I can start using them right away. 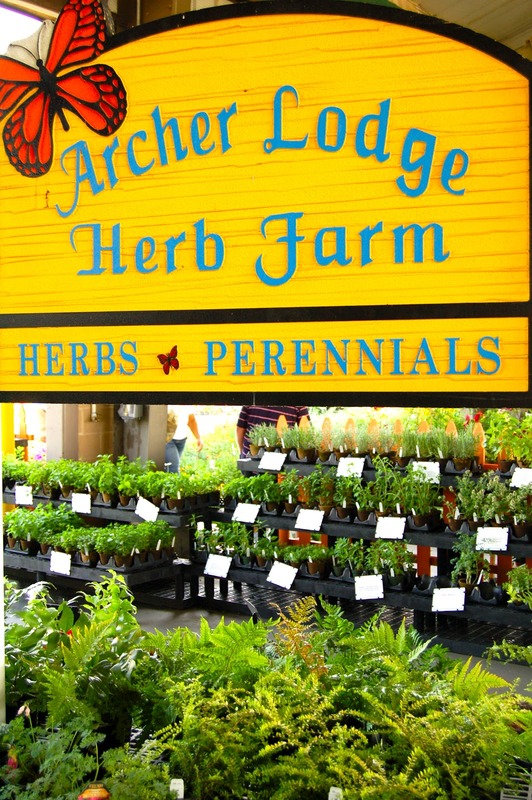 Archer Lodge Herb Farm is my favorite spot at the Raleigh Farmer's Market to pick some up. I am waiting patiently for them to get parsley and tarragon so I can add to my collection! 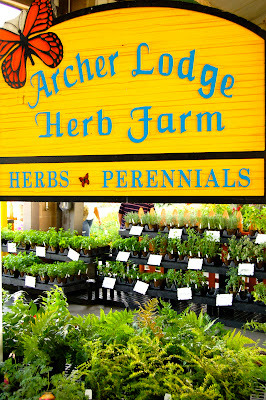 Since the weather has been warm and we've had random rain showers, the herbs are growing like crazy!! I usually bring in a bunch to work and hand out so I don't have to throw them away. But another great solution is to make pesto! Most people think of pesto with basil, which is usually true. But why not take the same concept and apply it to other herbs that are growing rampant in our garden. Oregano was one that I need to use up and fast! I have included a recipe for oregano pesto below, but this has a bite to it - be forewarned! For a good basic basil pesto, head over to Heidi's site on 101 cookbooks for an authentic Italian recipe (here is a hint, it is all in the technique). Here is the easy part - put everything into a food processor and start blending it all together until you get a well combined pesto. Add in more salt and pepper to desired taste and lemon juice to prevent the pesto from turning brown. Keep this in an airtight container in the refrigerator for up to 3 weeks. July is a very crazy month for the Hubby and I. We are traveling every weekend from the mountains to the coast and even up to Chicago. We do this to ourselves every year, despite swearing we won't. Somehow the summers just fill up for us though. Trust me, we aren't complaining, but the temptation to order take-out or go out is very strong when we are this busy. Must....stay....strong and fight the urge to order take-out!! So I use my strength and focus on quick recipes. 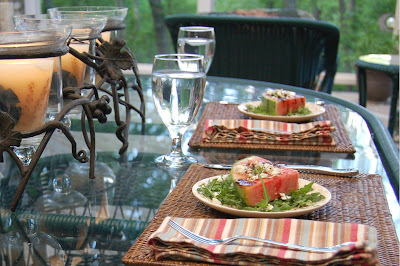 One of our favorite quick and healthy recipes is a Fresh Watermelon Salad - great in the summer. 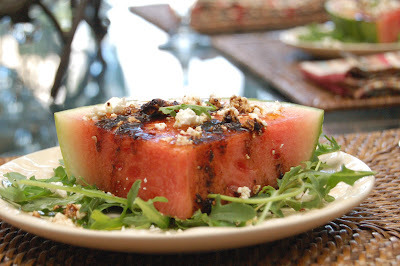 Originally inspired from an Italian restaurant my Mom and I went to several years ago, and then tweaked, this is a great way to use all the fresh watermelon taking over Markets. Divide the arugula among the plates. Top each plate with a watermelon slice and drizzle with balsamic vinegar to taste (a good rule of thumb is one teaspoon per plate). Add feta cheese, salt and pepper to each. Top with prosciutto if using and lastly, drizzle with olive oil if desired. It was a great celebration - friends, food and fireworks for the July 4th holiday this year. We decided to take it easy since it was a work night. We invited some friends to come over to grill and have a few drinks. Everyone brought something and was hard at work prepping for our grill feast before the fireworks! With a trip to the Farmer's Market earlier in the week, my friend Virginia and I had gathered all of the sides and fixin's (as we say in the South) for our 4th of July feast! We started the evening with a few appetizers, as any party should. I made guacamole and put out fresh salsa. Virginia made Deviled Eggs that were scarfed down in about 2.5 minutes! We had fresh cherry tomatoes with olive oil and balsamic vinegar, grilled vegetables and corn from the Farmer's Market. The boys decided to throw a few steaks on the grill to go along with all of the vegetables. The five boys put their head together and incorporated a few new tips for the steaks. First they scored the steaks (to prevent the ends of the sirloins from curling), then they used half an onion to rub the grill grate for extra flavor and to apply oil to the grates. One of the guys even picked some basil from our garden to throw on his steak. 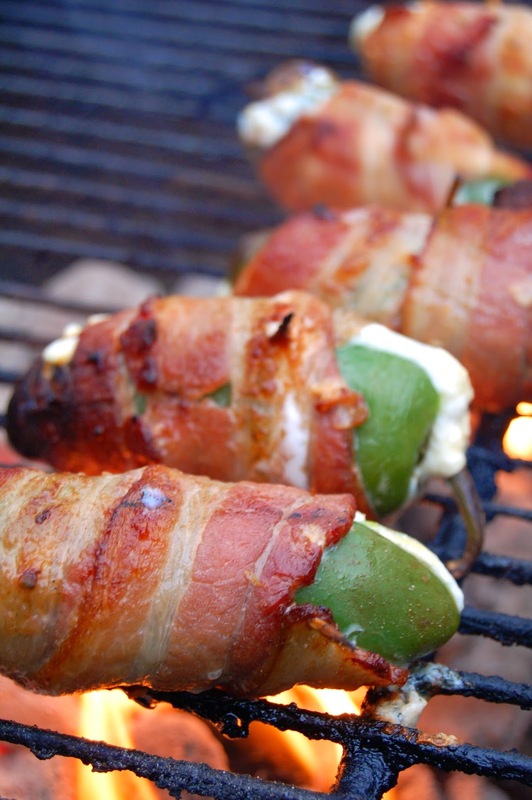 With all of the grilling going on, we thought it would be the perfect day to bust out our jalapeño poppers! I know what you are thinking, deep fried. But not in this house!! This is a delicious and healthy version using a whole jalapeño, cheese and bacon (which you can leave off to make vegetarian). Everything can be prepped ahead of time, and thrown on the grill with other things. We had both grills going on this day, so I squeezed them in between the corn and mushrooms. * optional ingredients for the filling are chives, garlic, pimentos or red pepper finely chopped, cooked sausage, etc. The possibilities are endless! First, soak the wooden toothpicks in water for at least 30 minutes before grilling. Heat your grill to medium-high heat. Cut the jalapeños in half lengthwise and scrape out the membrane and seeds with a small spoon. If you would like a hotter popper, leave some of the seeds in the jalapeno. I usually do half and half for a variety. Make sure to keep the halves for each jalapeno together so they are matched up. In a medium sized bowl, mix the cream cheese and shredded cheese together until well blended. Here is where you can add in any additional ingredients that you wish for the filling. With a small spoon, fill one half of the jalapeño with the cheese filling until it is slightly overflowing, but can still place the other half of the jalapeño on top so they connect. Fill all jalapeños with the filling. Pull out your bacon and slice the pieces in half. (Note, it is easier to work with chilled bacon). If your bacon is really thin, use a whole piece. 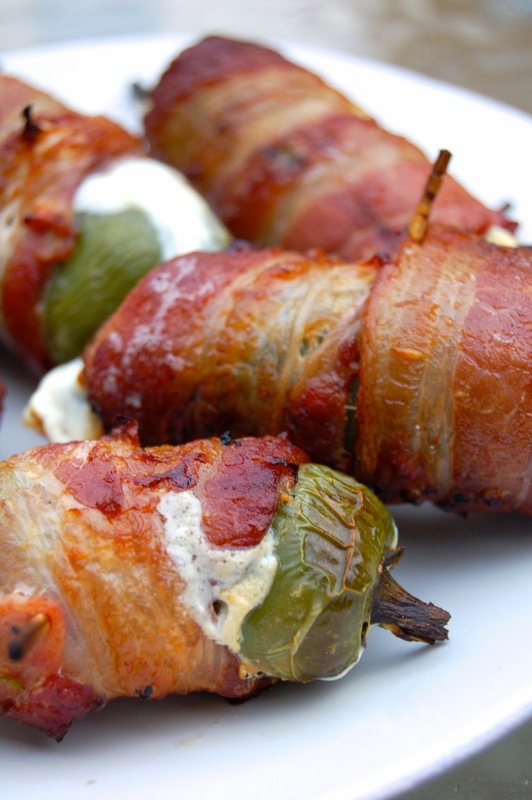 You can also leave off the bacon for a vegetarian version, but still use a toothpick to keep the jalapeño closed. Wrap a half a piece of bacon around the popper and use a toothpick to secure it. Repeat for all jalapeños. 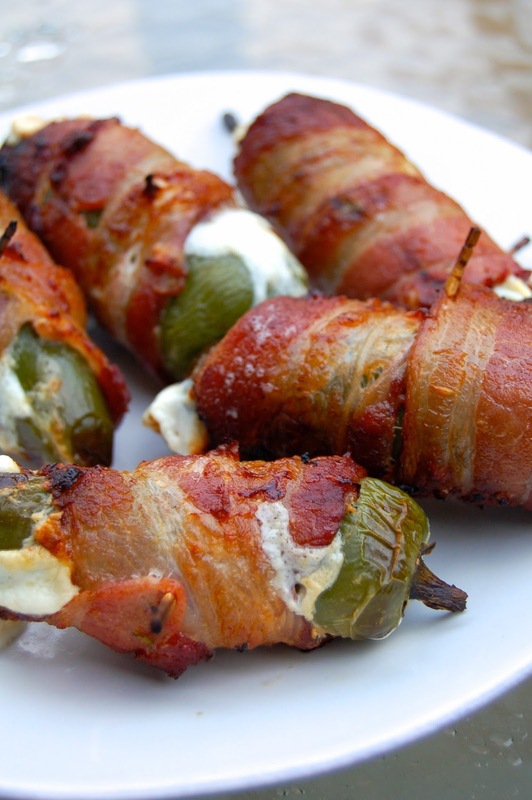 Place poppers on a piece of heavy-duty aluminum foil, that has been sprayed with cooking spray or olive oil. Grill for about 10-15 minutes, depending on your grill**. You want the bacon to be cooked and crisp and the peppers to have a good grill marks. This works best on a charcoal grill. **You can also bake these at 400F for 15-20 minutes. The nation's birthday, a day to get together with friends and family in your most patriotic outfit and grill while you drink fun cocktails and watch your neighbor set off fireworks from his driveway. I couldn't think of a better day! This year, the holiday falls in the middle of the week, so planning ahead is a must. There is a recipe on KettlerCuisine for every culinary need this holiday. 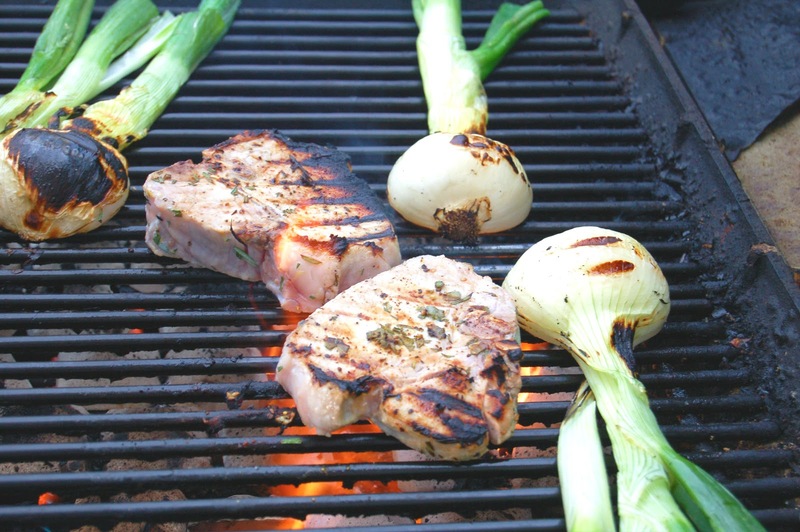 If you find yourself hosting a shindig, try the Buttermilk-Brined Pork Chops. These are the most tender and juicy chops you will ever eat, not to mention super easy to prepare AND ahead of time. Several of our friends have tried this recipe with other meats such as a pork tenderloin, chicken thighs or breasts and had equal success. For something on the sweeter side, you can whip up the Chocolate Stout cake with macerated blackberries or top with other fresh summer berries. If you can still find good strawberries, go for the Strawberry Rhubarb Crumble or my grandmother's Strawberry Pie with fresh whipped cream. Whichever dessert you choose, be sure to include fresh summer berries not only for their sweet taste, but their resemblance to our nation's flag!! Even though the weather is expected to be 100F in North Carolina on Wednesday, this won't stop us from enjoying food, fun and friends. What are some of your favorite July 4th dishes? ?